Awang plak, coming back from Sarawak bought me this..
..ngan alasan,"Aritu mase kat Sedim sy prasan kipas kak Ayu dah patah so sy carikkan yg same ngan yg dah patah tu buat ganti" Auwwwww, so sweet! 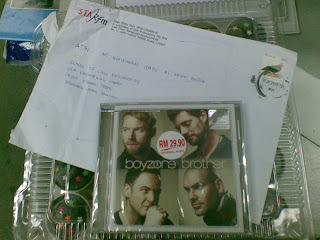 And from abg Azahar plak.. 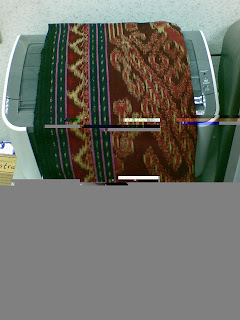 ..I use as a table runner at home sememtara nak basuh table runner yg gune skrg. Dia kate buat ganti the missing shawl yg dia penah kasik dulu.. alahaiiii Yee, tak yah pun takpe. Dah la bukan salah dia pun shawl tu ilang, it was lost in this room when we went out tp Yee insisit jugak nak ganti.. wahhh, baiknye adikku ini. A quick entry since I'm supposed to be teaching Prof Meor's son in 3 minutes..
My friend here, Fisya asked me to do something for her 2nd anniversary. 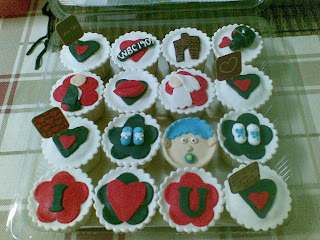 A tale-themed cupcake set using fondant. Pasal dari zaman berchenta saaaaampai la dah ade anak sumer ni and pk punye pk, this was what I came up with..
A few months ago, my student Aminah gave me some choc cheese cake her mum had made.. yummy! However, everytime I wanted to give back her container, she never came (and I isi ngan bende beli kedai je coz malu tak pandai masak cam mak dia). But seeing that its nearly Ramadhan and since I won't have any classes with her for the whole month, I decided to pakse her to come (didn't have to actually coz suddenly her school didn't have any activities that night haha..) and make something. 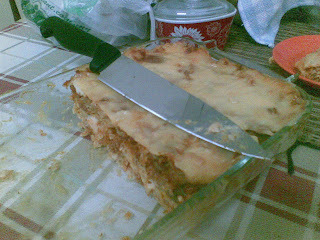 Rummaging through my kitchen cabinets and fridge, I was suprised to notice I HAd the ingredients to make one of my fav dishes.. well, excluding the tomato puree which I was sure was sold in the nearby store so I decided to make it..
..until I realized I dodn't buy the tomato puree yet haha.. aperaaa Ayu! And would you believe, they only had the small can.. and only ONE was sold that day.. adesss! 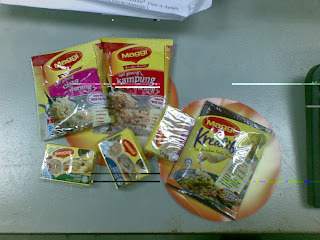 Rosak recipe ku.. and to add insult, I FORGOT to put some salt in the meat, sabo je lah. Tp ku gagahi jua and the end result wasn't that bad la kot. 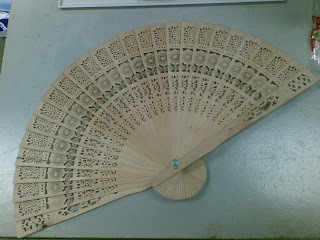 Takde la sampai tak leh nak telan kannnn.. so what did I make? 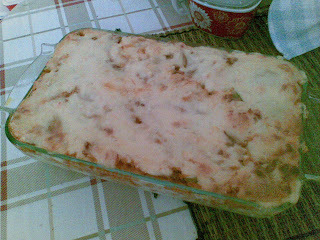 Ye la.. baked pasta je pun. Wanted to use the usual macaroni tp at my home cume ade spirals and malas gile nak gi cari coz the macaroni sold at the nearby store was this brand yg sy tak kenal, thus, sy tak mo cube la kan.
Sempat la dibungkuskan untuk Aminah and my usual 'rakan bertukar juadah'. Then took a bit for myself and the rest here.. Okay la, its not the RM1000++ type of bag, nor is it in the hundreds.. my guess is its not even RM10 haha.. but its the thought that counts kan hehe.. When I was in form 2 (which is like millions of years ago la kan time dinosaur pun dok atas bumi lagi), the first time I went for an 'outing', I bought this bag from Popular. 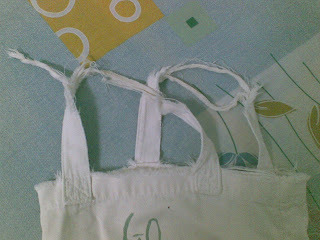 It was just a small bag bg CAP (Consumers Association Penang<-- btoi ka?) promoting the usage of reusable bags instead of plastic bag. 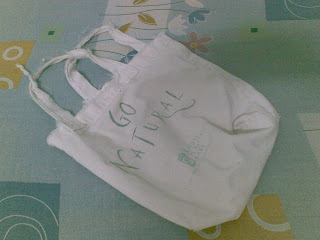 Then, there were no reusable shopping bags like the ones we find in Jusco nowadays, this bag was made from cotton (?). I used this bag for my telekung from then right till now (see, the bag is now older than me when I first bought this bag) and I really loved it. I dunno why, maybe the sentimental value of it being my first purchase for the first time I went out with friends or something but I REALLY used this bag. Now the past few years, my friends keep telling me to buy another bag. Why? See.. haha.. and here's a close up of the handles, sgt reput ok! 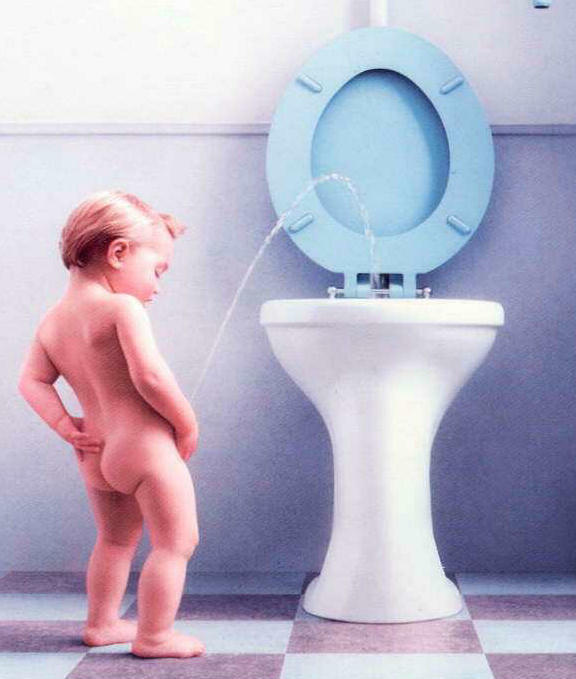 Its literally hanging by a thread there.. and still I use it! 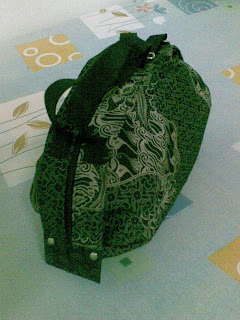 Tatau la sbb sentimental value ka or sbb malas nak cari another bag haha.. 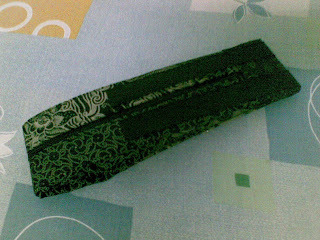 Anyway, last month, the staff in our school went for a trip to Bandung and one of my friends bought me some cloth for baju kurung (the kind you can find merate² over there) and something else..
At first I thought it was a pencil box but I was puzzled on how hard it was for me to open it and stuff my stationary there. That was when Rashid came in and had the laugh of his life at me hahah..
Ohhh.. bag rupenye hahah.. malu ok! 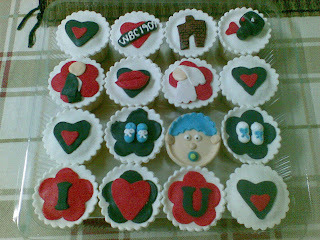 What came from my oven..
A few days ago.. scratch that.. last Monday, I decided to bake yet another cake. 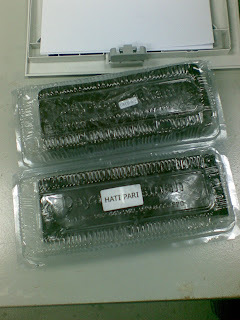 I had leftover tinned pineapples and peaches from my previous cakes so I decided to make a one with a mixture of both of these just to finish it of before it rots in my fridge and since a staff here complained that he never gets any of my cakes (mcm la sedap sgt kaaannn haha..), I decided to give them to the akak² and adik² technician. I dunno what came over my oven but apprantly it now takes less time for me to bake a cake. But me being me, thought it was business as usual in the baking department so even when I smelt something burning (some of the fruit syrup had dripped on my 'oven floor', I thought it was the sugar in the syrup burning), I didn't bother to check. 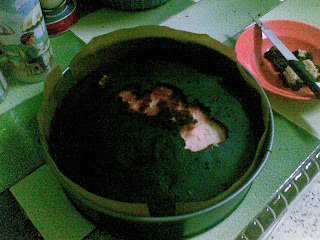 It was only when my heart told me something wasn't right that I went to my oven and of course la melompat trying to save my cake.. This is what I get for ignoring the smells! Luckily only the top part was burnt so I just had to cut it of. 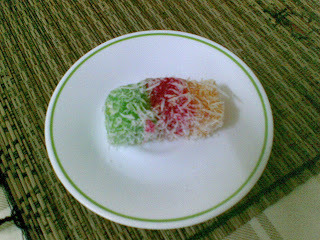 My cake turned out a bit short, but luckily, it was still good.. Alhamdulillah! On a more positive note, the leftover peaches I talked about earlier came from this cake.. tadaaaa! 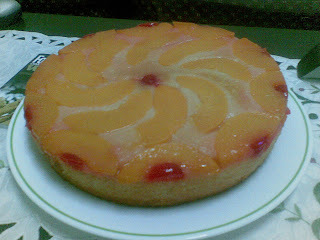 It was more or less like the pineapple upside down only this time with peaches. Just wanted to see which one came out nicer. I've got a 50-50 response with some prefering the pudding-ey texture of the peach topping, while others prefer the crunchy pineapple top.. oh well!